My associations with Miss Saigon are tied with my earliest days as a musical theater nerd, buying and over-playing the soundtrack, and ultimately seeing the original production on Broadway, helicopter landing and all. So, I approached the latest production at SHN SF with some trepidation. Could it really hold up after all these years? Would it be dated, or awkward, or both? These fears were unfounded, and not only is this touring cast extraordinarily strong, the direction by Laurence Connor and set by Totie Driver and Matt Kinley — derived from the 2014 London revival — are as vivid and fresh as a Broadway premiere. 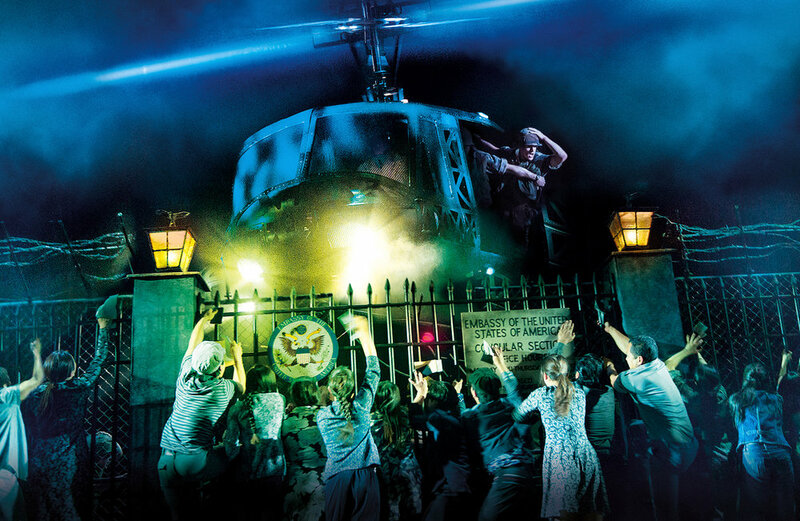 Miss Saigon was the second major musical to come from the team of composer Claude-Michel Schönberg and lyricist Alain Boublil after the blockbuster success of Les Miserables, and it premiered on Broadway in 1991, four years after Les Mis, breaking records for advance ticket sales at the time. The musical has a similar grandeur and historical sweep as Les Mis, set against the background of the late days of the Vietnam War, grounded also by the small, personal stories of a handful of characters. Those who watched Ken Burns’ recent Vietnam documentary will have a better or renewed understanding of the life-or-death drama attached to the fall of Saigon and the Americans’ abandoning of their own embassy. That historic moment, and the chaotic days leading up to it, form the core of the background plot in Miss Saigon, in which a young, reluctant Vietnamese prostitute named Kim (Emily Bautista) falls in love with an American soldier named Chris (Anthony Festa). Their love story takes its cues from Madame Butterfly, and anyone familiar with that opera will know that this is not a happily-ever-after kind of show. Kim and Chris get separated on that fateful day in 1975, and their lives take divergent courses before they are reunited, dramatically, three years later in Bangkok. Helping the story along, and originally introducing Kim and Chris is The Engineer (Red Concepcion), a bawdy, self-interested, comical character who starts out as a bar owner and pimp, lands in detention and “reprogramming” with the North Vietnamese after the war, and claws his way back to a better life, partly on the back of Kim. Mr. Concepcion, a consummate performer and clown, becomes the beating heart of the show despite having an ostensibly supporting role, and by the time he does his Act II solo showstopper, “The American Dream,” the audience is fully in his pocket. As Kim, Bautista has some forceful and mesmerizing acting moments, but her voice falls short on power during some key solos. By contrast, Mr. Festa is fantastic as Chris and a pleasure to watch, his voice always striking the right balance of passion and control. But it’s the eye-popping, cinematic allure of the sets and the top-notch talents of the ensemble that make this show worth watching. The ensemble dance numbers “The Heat Is On” and “The Morning of the Dragon” are especially impressive, and the entire sequence involving the legendary helicopter is heart-stopping. While other revivals may merely do justice to their original productions, this re-staging of Miss Saigon is as good as it gets, with a cast who clearly knows they have a great piece of theater to perform every night. Miss Saigon plays through November 4 at SHN. Find discount tickets on RushTix, or find regular tickets through the box office.